Lead acid batteries are used as car batteries and in power backup systems. The connectors and terminals of a common lead acid battery are made out of lead metal. The electrolyte consists of 35% sulfuric acid and 65 % of water. The ability of this typ of battery to provide extreme high current makes the battery perfect as starter batteries in cars. six plastic caps for refilling distilled water. Maintenance (check of liquid level) is essential. Maintenance free batteries or gel batteries are completely sealed. They contain no liquids, so there is no need to control the level of liquid and no possibility of adding water. Maintenance free batteries operate in any position. 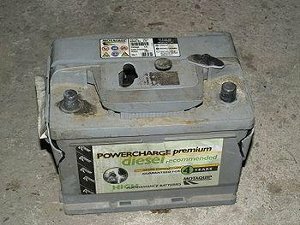 Car batteries provide extreme high current. NEVER short a battery. Be careful with tools while working on the terminals. A spanner which touches both connectors will be welded on immediately and the battery can explodes. In cars the negative electrode is connected to the body. If you want to take out a car battery, disconnect the minus connector of the battery first. If your spanner gets contact to any metal part of the car while unscrewing, noting will happen. If you would start with the plus terminal and you get contact with the body, you would short-circuit the battery with dangerous consequences (no fuse, extremly high current, overheating and danger of explosion). After disconnecting the minus terminal you are allowed to disconnect the plus connector. A contact with the body now has also no consequences. Installing the battery has to be the other way round. always connect minus at last. The charging voltage is very important. Is the voltage too high (over 14.4 V) water will evaporate, explosive gases will develop, and the battery gets warm or even hot. The battery gets destroyed. During charging the battery must never get hot. Water loss has must be replaced immediately with distilled water. Never use tap water. It contains too many minerals. Dry cell plates which are exposed to air loose capacity rapidly and get damaged for all times. Battery must not get hot at any time. Charging voltages must be checked. around the terminals. Be careful, lead sulfate is toxic by inhalation and skin contact. Before testing separate parallel connected batteries. Every battery has to be checked alone. All voltages are measured at 20 °C. A swollen, hot battery is very dangerous. Disconnect the charger and let the battery cool down before handling the battery. A hot battery probably needs water and the plates are already damaged. The capacity is poor and if the open circuit voltage is below 11.9 V the battery is defective and has to be replaced. Charging with over voltage (> 14.4 V) and complete discharging must be avoided in any case and are the reasons for most of battery defects. In general a battery can not be repaired. Only with liquid acid batteries there is a small chance to reactivate the capacity by doing the following procedure: Charge fully for 8 - 12 hours, wait 24 – 48 hours and charge again. Repeat it this procedure if necessary. This does not work with maintenance free batteries. New acid batteries are precharged but empty. They have to be filled up with acid before usage. Then, after waiting for half an hour the battery is ready for use without charging. Motorcycle batteries are often based on a different (older) technology. They have to filled up with acid and charged some hours before using. The life span of a car battery depends on the charging and discharging cycles and the surrounding temperature. Under perfect conditions a battery can live for 10 years under 25°C and only 5 years under 33°C. The storage of batteries should only be done with fully charged batteries.